And that's 1 whole year of Sunday Stash! Cloud9 fabrics are 100% certified organic; printed and dyed with low impact materials. The colors are vibrant, the prints detailed and original. Beyond the Sea - Anemone - is a new favorite! Without any doubt I need more of this particular print, what a wonderful quilt backing it would make. 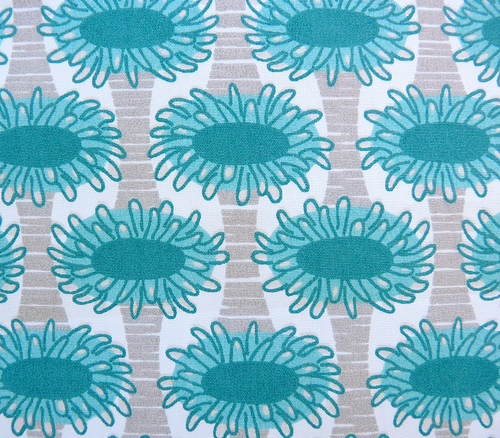 The entire Beyond the Sea range is available at FabricWorm and at Modern Organic Fabrics (on Etsy). I *just* got some Anenome and Sand Piper in the mail this morning and I agree with you about Anenome! The colors are just so pretty and the print so detailed. Oh I love that it's organic. Great picks. 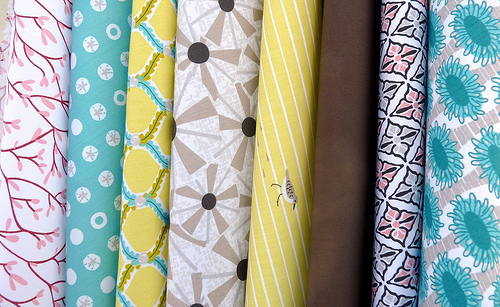 This is a beautiful line of fabrics - Michelle Engel Bencsko is a wonderful designer. I especially like Sandpipers. P.S. I want to thank you for recommending "The Gentle Art of Quiltmaking" - I bought it, and it is such a great book. I've been inspired by many of Jane's designs and have so many ideas already! HRH, Cloud9 is also being sold here in the UK which a lot of really fab designer fabrics are not - I have to say I'm sorely tempted by the grey windmills maybe to mix with some Hope Valley. Fab isn't it?! Can't wait to get more than my little swatch set! Blue/teal generally is not my color, but I love this one! I love this line so much. I haven't gotten any yet because, well, I'm having a hard time with the organic price, but I just might have to break down and get some soon. Those sand pipers just kill me! I love Anemone too and just got my first piece. I know it will be he first of many. It is so beautiful and can go with so many other colors and patterns.